SOUND MUSEUM VISION is located in 5min walking distance from JR Shibuya Station. It is right in the middle of Dogenzaka. It is live-event space which has more than 900㎡. Maximum capacity is 1000 people. There are 4 dance floor with different characters. Main dance floor “GAIA” holds 500 people. Each floor has Ray Audio Speakers, which is used in many top studios. This place has been used for many entertainment shows, fashion shows, various conventions etc. 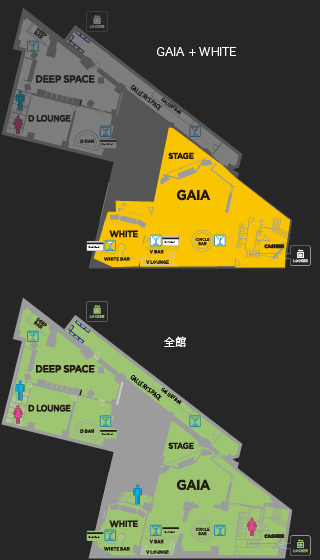 “WHITE” which is next to main floor “GAIA” can be used for DJ party as sub-floor, or dressing room or souvenir shop. “DEEP SPACE”, “D LOUNGE” can also be used in multiple ways. Live performance for your precious artists, making special announcements, space can be used in anyway to make your dream come true. 5F Mets Daikanyama 2-13 Sarugaku-cho, Shibuya-ku, Tokyo. You can download brochure from here.